Late last year my friend Joyce & I were having a cuppa together & I was telling her about some of my revamps. Joyce works as a Volunteer at the local Church Op Shop. "There's a cupboard at the shop you might be interested in" she mentioned .... "it's only $3"
My ears pricked up !!! "Yes please I definately would be interested"
"It's kind of a wooden bedside cupboard" she informed me "you could paint it up - I'm coming out this way tomorrow, I'll drop it off to you"
There was only one small teeny tiny detail that Joyce forgot to mention . . . .
. . . the $3 cupboard was painted bright purple !!! When she unloaded it from her boot & sat it on my deck, I thought The Mr was going to burst a foofoo valve !!! There were at least 2 occasions when I attempted to clean out the sleepout & The Mr dragged "that hideous old purple thing" over to the burning heap. But I would always drag it back again. It was in such rough condition that it would require a major overhaul in order to ever on-sell it again. 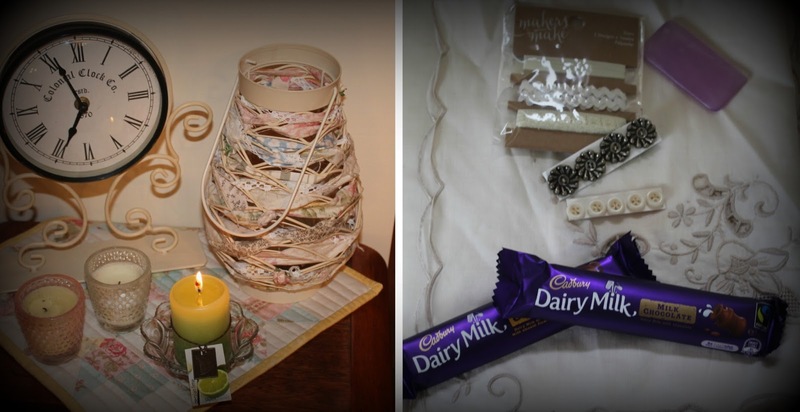 Then last week when I was tidying up the Cottage decking an idea came to me. I dragged the purple cupboard out of the sleepout & set it up on my deck to paint. A rummage in the back of my craft cupboard & I came across 1 1/2 testpots of Hot Chilli red paint from Resene . . . this would have to do !!
. . . & the purpose of the newly painted cupboard I hear you asking ??? Note to self ......Julie finish scraping the paint from the windows !!!!!! I asked The Mr what he thought of the purple cupboard now but he declined to comment & just shook his head !!!??? The delicate lime scented candle is still going strong but I must confess there are a large portion of choccies missing !!!! I was lucky enough to have a visit from my lovely friends Claire & her Mum Nancy, from Hawera. These girls were on their way North & we enjoyed a fun lunch together. Last week when I looked after little Alec, we decided to make a start on some spring cleaning .... as you can see Alec was sooo helpful !!!! 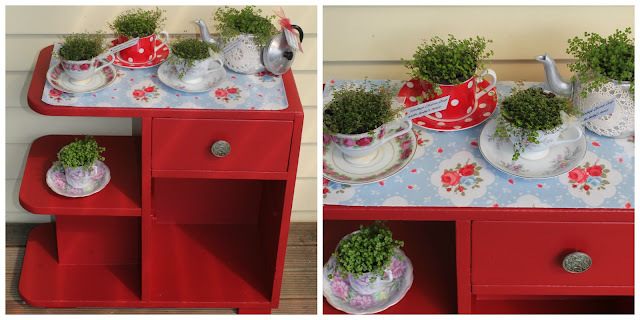 That's a great use for the little cupboard, the oil cloth on the top makes all the difference. Glad you have had little Alec over, these times are the most precious. 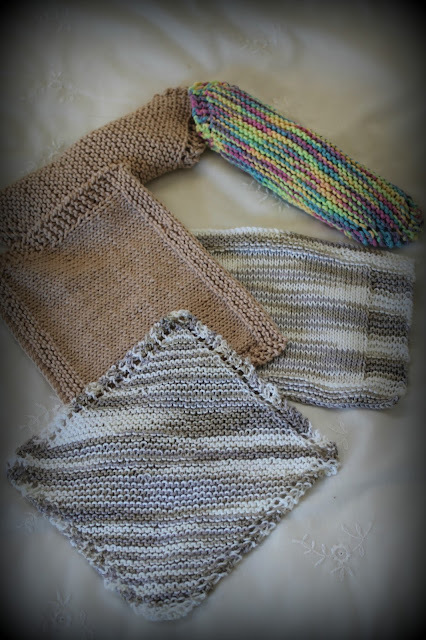 Your climate doesn't seem so alien now as we are heading into Autumn here and I am beginning to feel the need for candles, blankets and nights in! and design...I did like either colour really! painted it...mmmmM! No prizes for guessing! :). sets it off, a treat! much the same as girls..not so much now a days though! 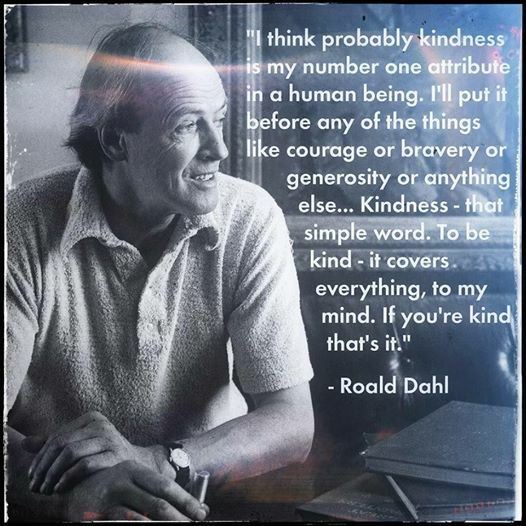 Lovely saying by Roald Dahl...Kindness! so easily forgotten! Pippi and Blackie....As there seriously omitted from this one! Alec, what a sweetie! he looks right at home in a kitchen. Love, love the red cupboard........w-a-y better than purple! Wow Julie!!!! What a transformation!! I love purple but even that little effort was a bit much for me!! Love what you do with the babies tears, their containers look wonderful. Lovely to see Alec helping you!! He has the most beautiful eyes. 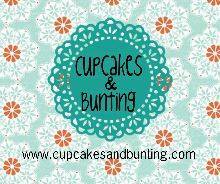 Hope the wintery weather picks up soon for you. My dad used to say foofoo valve so I had a giggle at that. 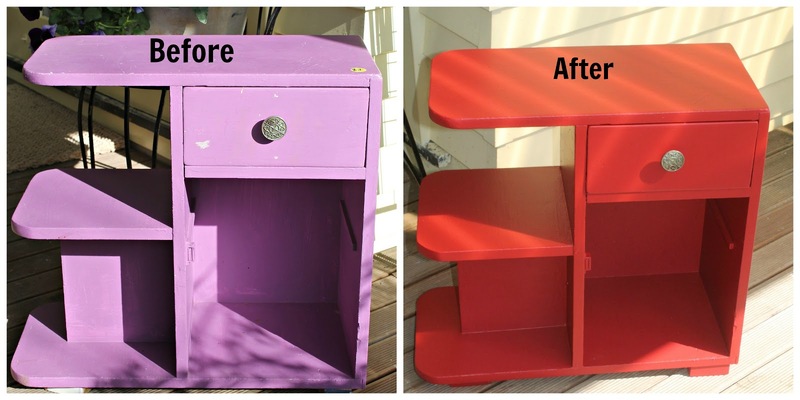 Love what you did to the purple cupboard, the transformation is super gorgeous and perfect for your baby tears. I swear little Alec is getting more cuter everytime you share a photo of him. Look at his beautiful big eyes, and that butter wouldn't melt look. Hi ya Julie, well I was going to agree with your Mr, you know purple is my favourite colour, but that looked hideous haha, amazing what you did with that little cupboard. 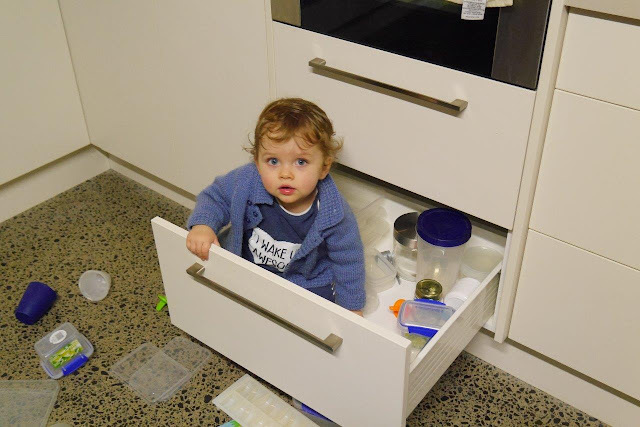 Little Alec looks to be having a ball, great fun those pot drawers for the little ones. Have a great week Julie. Chris xoxo. 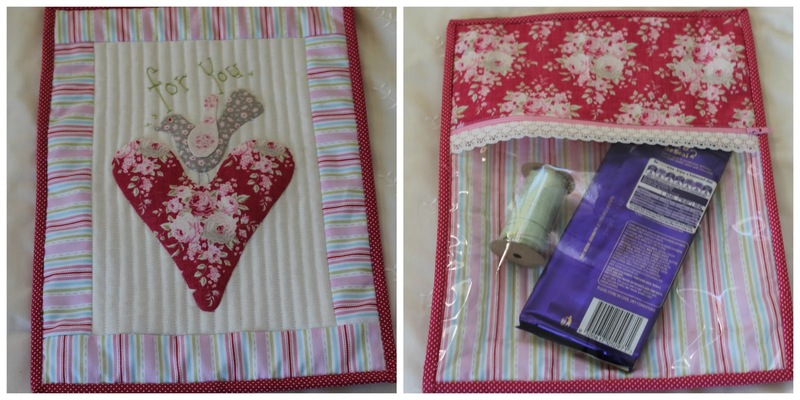 Love your little cupboard. I knew a small detail about being painted purple wouldn't stop you from transforming it into an object of beauty! Love the new colour and the oilcloth is perfect sitting atop it. 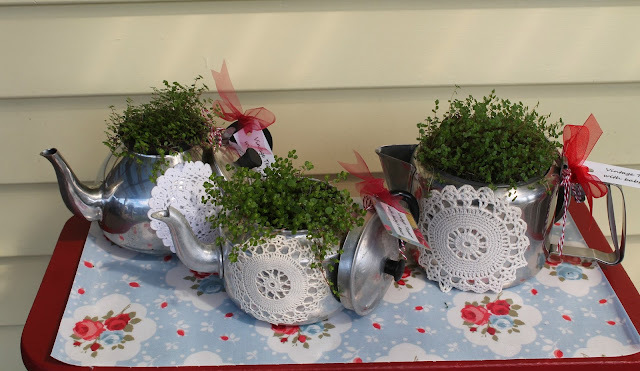 Love the teapots. So happy your husband didn't burn it!! You received some gorgeous pretties. 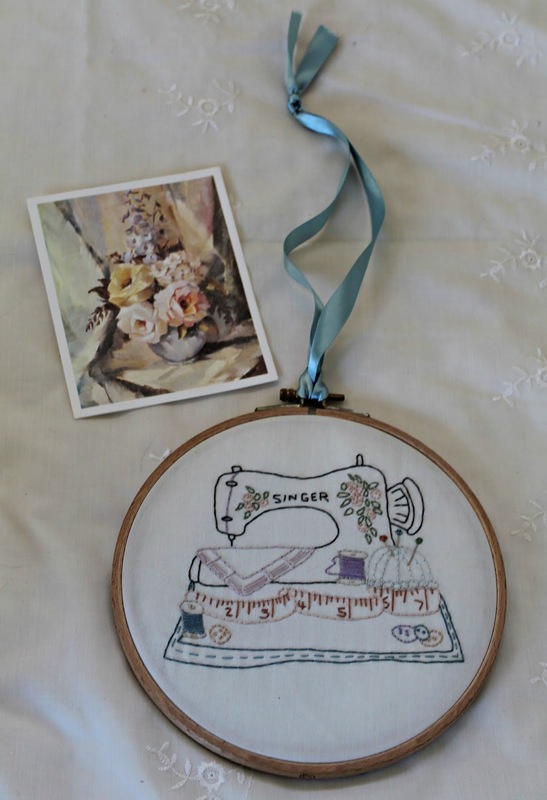 How sweet is that little sewing machine stitchery. Your Alec is adorable; he really does have the most beautiful eyes. Hope the weather over there begins to warm up soon. the cupboard looks wonderful, though am a purple fan myself too. Hi Julie, Thank you for your kind words, really appreciated as I have been through a nasty family upset and didn't think I would be able to get back to blogging, perhaps it wasn't right to mention it but I wanted that person to know how much it hurt. 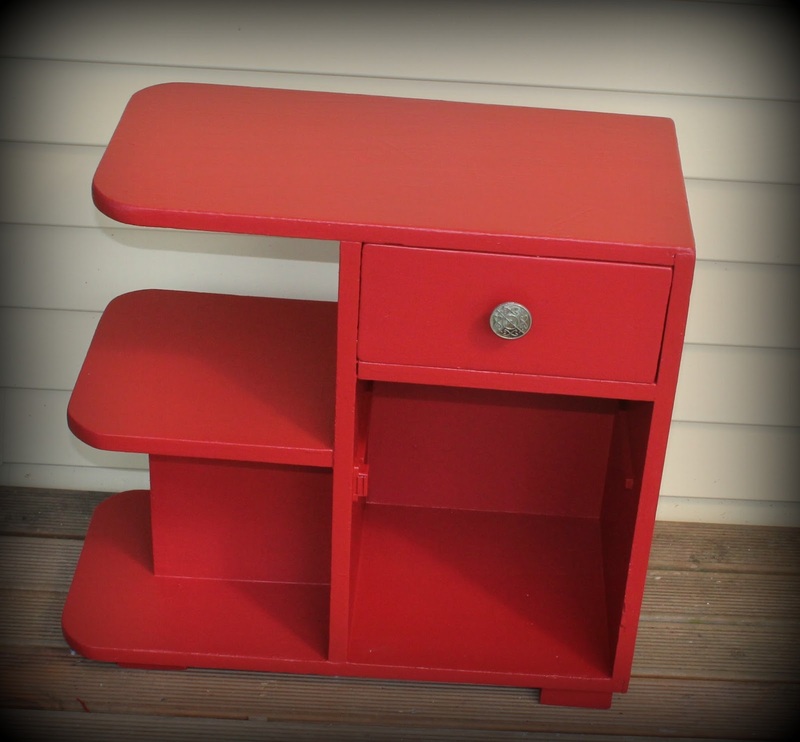 Wow Julie I soo love seeing what you transform things into.. chilli red of course is a gorgeous colour. Hi Julie! What a perfect cupboard! I love the color (sort of chili red!). What a cute grandie grand! I wish I could visit your shop/home. You are such an inspiration, Julie. That little cupboard looks amazing now - love the colour. oh yes the cutest little one is so helpful hahah reminded me the days when were as helpful dear.